The Aegis® BFV series fully lined high performance butterfly valves feature the most advanced technology available for controlling and isolating corrosive, ultra-pure, and highly-toxic process liquids and gases. The BVF series valves are designed, engineered, and manufactured under a company-committed quality assurance process that has been audited and approved by the SQS ISO 9001:2000 for Quality and Management Systems and the PED (Pressure Equipment Directive) 97/23/EG for mechanical integrity. 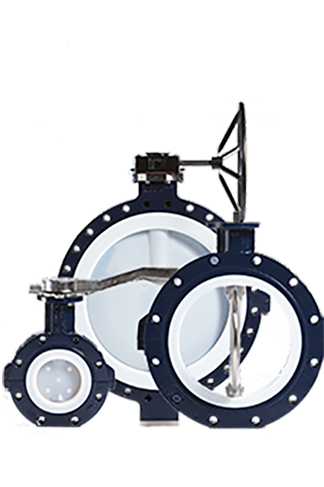 The unique geometric profiles of the disc and liner eliminate the cold flow and deformation issues typical of conventional lined butterfly valves, resulting in a conditional, environmentally safe, life time shaft seal guarantee. Double D Stem Connection up to 6"
API 598 - Details for the Testing and Inspection Requirements for Butterfly Valves. MSS SP-67 - This Standard Practice Covers Dimensions, Design, Testing and Marking Requirements for Butterfly Valves.